VANCOUVER – Kevin Royes lives the Vancouver real estate economy. 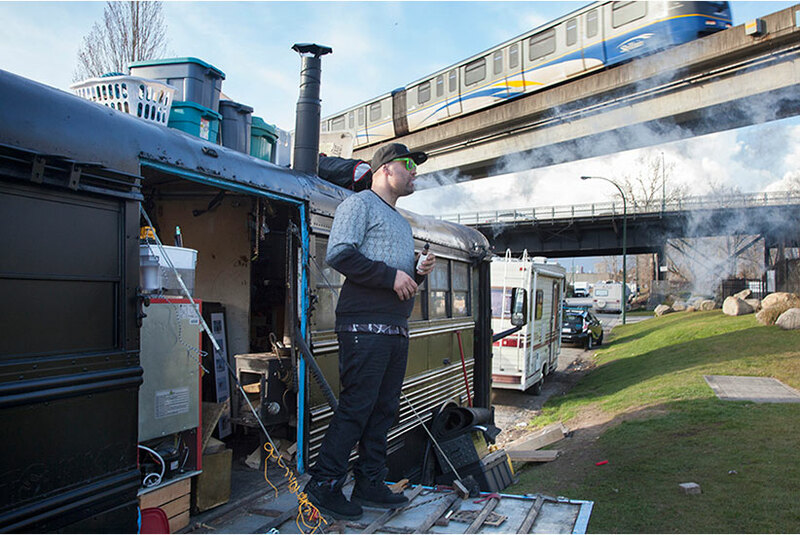 At the end of a long day landscaping at a newly-built 18,000-square-foot mansion in West Vancouver, he catches a ride home to his 1973 Dodge Sportsman in a pop-up RV park tucked away in an East Vancouver industrial area. 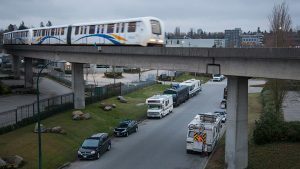 There are about 20 inhabited vehicles parked beneath the Skytrain line near Glen Drive. But in Vancouver and North Vancouver, where rents are among Canada’s highest and vacancy rates less than one per cent, there are at least seven other pockets where people live full-time in vehicles tucked behind shopping malls or big box stores. Some, like Royes and Mike Diddy, whose home is a converted school bus, are employed in the region’s booming construction trade. Others are engaged in less savoury lines of work and others still are pensioners down on their luck. Diddy, also a DJ, owns a matte black 1991 Blue Bird school bus that he drives to summer music festivals. Last June, after a run-in with his landlord, he moved into it full-time. Since then, he’s saved more than $10,000. It is not illegal to live in a vehicle, but city bylaws prohibit oversize vehicles from parking on city streets for more than a few hours. Those whose vehicles still run try to move them at least a few feet every day. City officials are aware of the campers and generally don’t hassle the inhabitants unless someone complains. An adjacent business recently called in after one motorhome occupant ran an extension cord across the boulevard to steal power from an outdoor plug. That triggered a round of tickets, which start at $70, for everyone camped along the street. Sanitation is a challenge for those living in vehicles without facilities. One passerby grumbled about human feces on the grass boulevard, though on this day the area appeared clean. Royes’ motorhome is broken down, so he hires a pump-out truck to come to him. Fred, who lives in a minivan crammed with his possessions and works as a carpenter for a temp labour pool, uses the nearby Home Depot washroom. He would not give his last name or age because he didn’t want friends from back east to find out how his life turned out. He looks at least 65 and seems lonely. His kitchen consists of a propane-powered burner, and a single bowl knife and spoon. Fred’s last job was on a 30-storey high-rise in North Vancouver. But temp work is sporadic, which is how he lost his last apartment. “I got behind,” he admits. Like everyone on the strip, Fred doesn’t complain. He’d rather talk about library books he reads, or a documentary he saw about East Timor.